Ortovox made their Swisswool Light Tec line even better! The new Pertex outer fabric is even more stable and ensures that insulated products remain reliably windproof and water-resistant. Our Swiss virgin wool comes in a thin, light-weight and easy-to-pack variant. The new wool fibers weigh just 60 g/m², making them ideal for ski touring where less is more: less weight, less volume, but more performance. Zones made of their new elastic and breathable Merino Naturetec Light and Merino Punchhole underscore the “high-tech” aspect of this line. 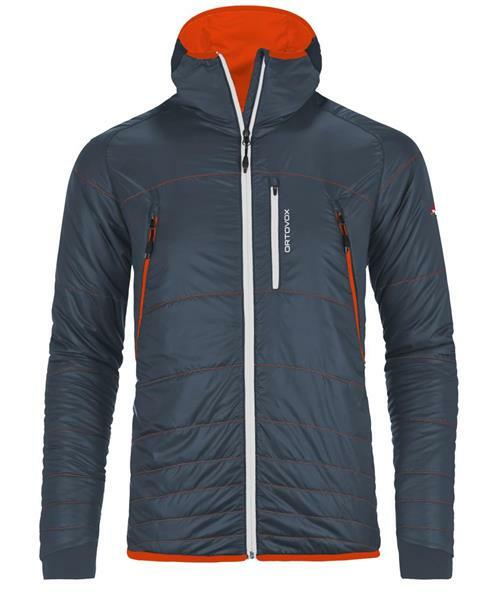 Ortovox has developed the (SW) Light Tec Piz Boe Jacket for demanding ski tourers who want to use products that are lightweight and offer a maximum level of comfort. The tight-fitting hood can be adjusted with one hand and protects the head from cooling down suddenly. And if it gets too warm, the underarm ventilation zippers provide rapid cooling. The elastic Naturetec Light inserts in the underarm area promise maximum freedom of movement and breathability. The two front pockets are positioned to allow optimum access even when wearing a backpack, and can even accommodate larger objects. There is also a smaller breast pocket for small items. Both the arms and the waist are provided with elastic cuffs, thus keeping out wind and cold.